This is an abridged version of a chapter from our new book: Unity AR & VR by Tutorials. Enjoy! Movement is an essential part of any VR experience, and the most common way to move a player is with teleportation. One of the reasons teleportation is so popular in VR is because it helps to avoid motion sickness — the human body doesn’t like it when there’s a mismatch between what it sees and what it feels. However, there are other ways to move besides teleportation, and this tutorial will not only cover the basics of teleportation, but also those other modes of transportation. Note: This tutorial contains different ways of moving around, some of which may cause nausea and disorientation for some people. The body physics, climbing and arm swinging sections may especially cause discomfort if you’re not used to falling or forced movement inside a VR experience. If you start to feel sick, take a break and get some fresh air. Use destination points to cover large distances. Use fixed positions for teleport locations. First, download the materials for this tutorial using the Download Materials button at the top or bottom of this page. 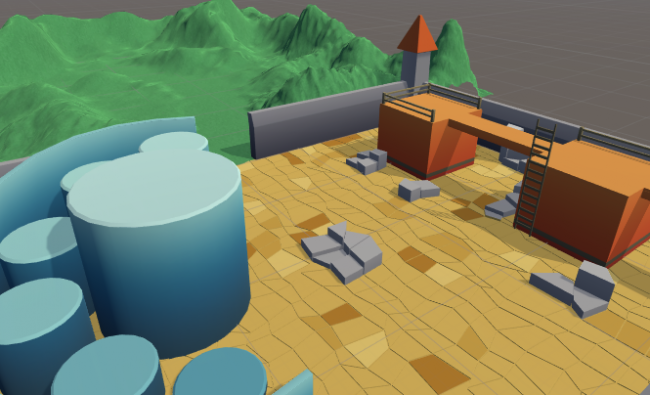 To begin, open the starter project for this tutorial in Unity and look around the scene. 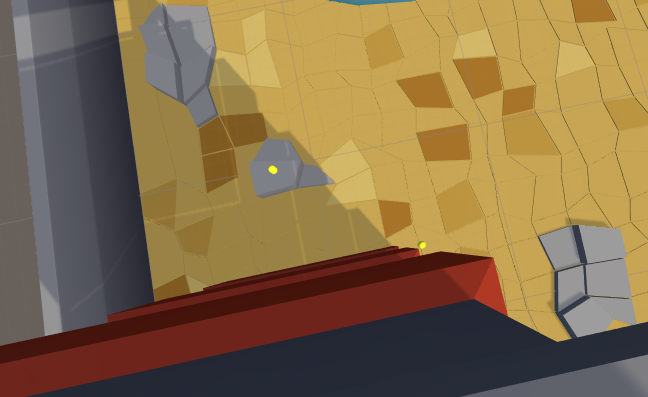 This scene consists of two sections: the obstacle field and the terrain. 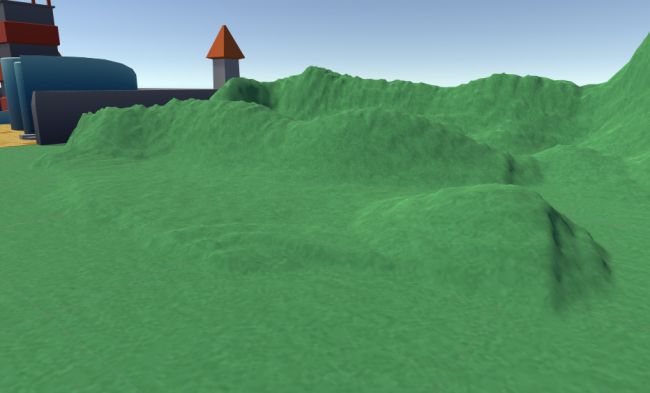 In this tutorial, you’ll only need to add GameObjects and components to the terrain. The scene doesn’t contain a VRTK SDK Manager so you won’t be able to look around the world for yourself just yet. 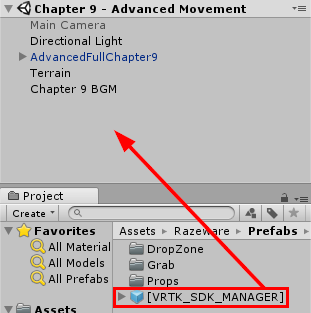 To remedy this, drag the [VRTK_SDK_MANAGER] prefab from the RazewarePrefabs folder into the root of the Hierarchy. Get your VR headset and controllers ready, then press the Play button to get a good look at everything from the ground level. To teleport, use the left controller. Not sure how teleportation works? No worries, because next up is a quick introduction to how teleporting works. Before adding any components, you should first understand how the VRTK_Height Adjust Teleport component that’s attached to the Play Area works. When you point the laser pointer at a collider and let go, a raycast is shot toward the endpoint. Both the play area and the player within get transported to the position of that point. This also means it can adapt to any type of collider, including terrain colliders. You can try this out by playing the scene and teleporting onto the green terrain. Perfect! With that out of the way, it’s time to explore some exciting ways of extending and replacing the movement system. While you were playing with teleportation, you may have realized that you can’t move to locations you can’t see. 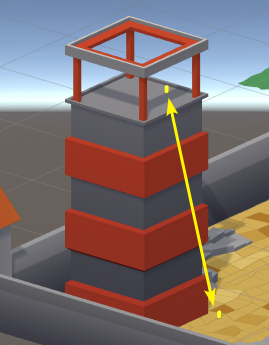 For example, if you wanted to teleport to the top of the tower from the ground, you won’t be able to because you can’t see it from the ground. 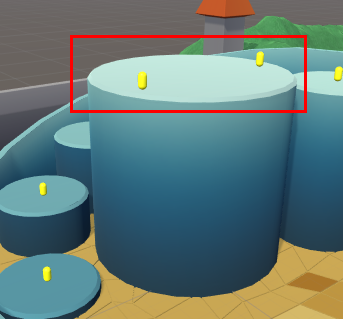 However, there’s a way to set up “portals” between two points using destination points. Add a new empty GameObject to the Hierarchy, name it Destination Points and reset its Transform. This acts as a folder for all of the destination points. 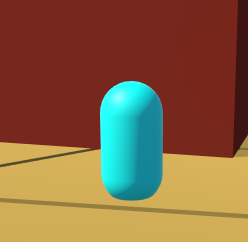 Now, create another empty GameObject, parent it to Destination Points and name it Teleport. Reset its Transform as well. This holds the destination points to teleport up and down the tower. 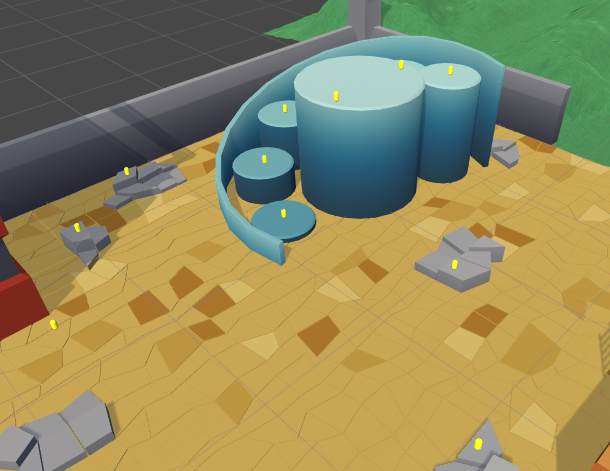 Drag a DestinationPoint prefab from the VRTKPrefabs folder onto Teleport to parent it. Set its Position to (X:-15, Y:0, Z:-16), and double-click the DestinationPoint in the Hierarchy to get a better look at it. Unlike in The Matrix, this blue pill can take you wherever you desire. defaultCursor: Blue, shown by default. hoverCursor: Green, gets shown when you hover over it with a laser pointer. 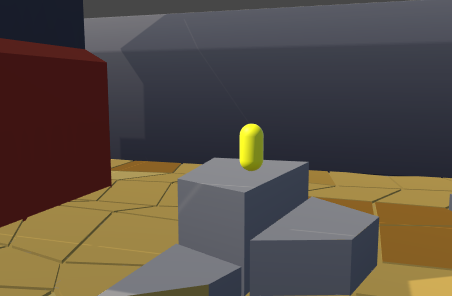 lockedCursor: Yellow, shown if Enable Teleport is turned off on the main destination point component. It’s time to link them up: select DestinationPoint and drag High Point onto the Destination Location slot. Now select High Point and drag DestinationPoint to its Destination Location. This creates a connection between them in two directions so that you can teleport freely between them. Play the scene and try it out. Point the teleport line toward the bottom destination point and let go like you’d do on the floor. If all goes well, you’ll teleport to the top of the tower. While you’re up there, enjoy the view. Some VR games don’t allow you to teleport everywhere. Instead, they rely on fixed hotspots to limit the player’s movement. This is ideal for creating immersive experiences and puzzle games like Myst and Riven. To create this behavior, you’ll need to use destination points again. Create an empty GameObject and name it Fixed. Parent it to Destination Points and reset its Transform. This serves as the root for the teleport hotspots. Now drag an instance of DestinationPoint from the VRTKPrefabs folder onto Fixed to parent it. Name it Fixed Point and change its Position to (X:-22, Y:1.5, Z:-10.5). 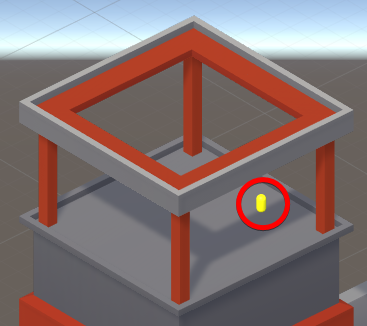 Everything is now in place for fixed teleportation, except one crucial detail: the player can still teleport around freely, so there’s no reason to the use the fixed points yet. 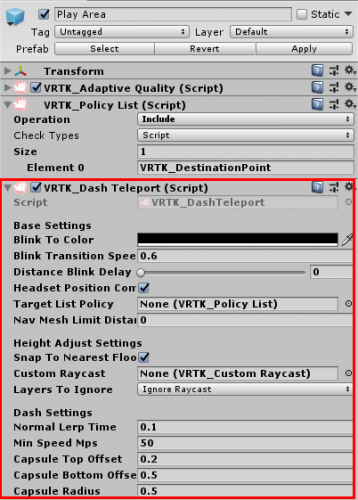 To limit the places the player is allowed to teleport, add a VRTK_PolicyList component to the Play Area under [VRTK_SETUP]. Because you’re limiting teleportation to only the destination points, set the Operation on the policy list to Include, set Check Types to Script only, and enter VRTK_DestinationPoint in Element 0. 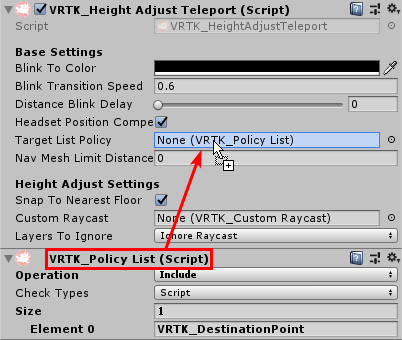 Drag the policy list component to the Target List Policy slot on the VRTK_Height Adjust Teleport component to make it use the list. That’s it. Play the scene and teleport around. As you do, notice how you can only use the destination points to move around. 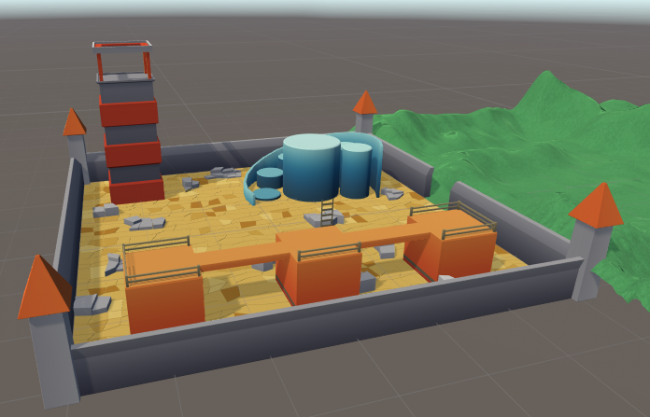 You can scatter more fixed points around and create a “scenic” route around the level by duplicating the existing ones and moving them to the terrain, for example. In a full game, you’d likely place them next to things like machines and other objects the player can manipulate. Before moving on to the next section, remove the Target List Policy from the VRTK_Height Adjust Teleport component by setting it to None. You’ll need free movement for the next mechanics to work correctly. Until now, you’ve been teleporting instantly to your destination. There’s another way to move around though: using dash teleporting. Dash teleporting means that you “dash” to the final position, which makes the camera smoothly move towards the destination. Remove the VRTK_Height Adjust Teleport component from Play Area and replace it with the VRTK_DashTeleport component. This component is derived from the Height Adjust Teleport, so teleporting will behave the same as before except for the dash movement. The replacement was all you needed. Play the scene and teleport around; you’ll notice you’ll be jolted forward after confirming the teleport destination. Note: After adding dash teleporting, you might notice that after teleporting to destination points, they disappear. This seems to be a bug with the current version of VRTK and will hopefully be fixed soon. Important Note: This section can make you sick. Simulated falling in VR can cause severe nausea and a feeling like the floor is being pulled away from under you. If you’re not used to VR or are sensitive to this, please sit down while testing. Time to take a leap of faith. Play the scene, get to the top of the tower and try walking over the edge. Once you’re there, look down. Nothing happens. 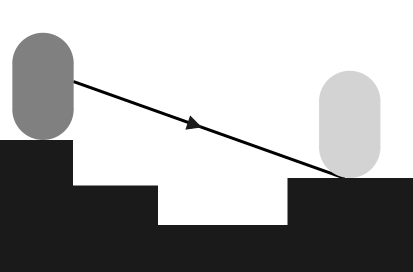 This is the default behavior for the VRTK setup — the height adjustment only happens after teleporting, not when walking around. To add gravity and ground collision, add a VRTK_BodPyhysics component to Play Area. The default values are great for semi-realistic falling and stepping on things like slopes. 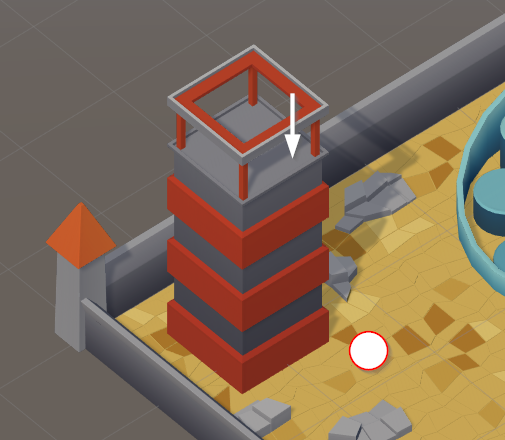 Try it out in play mode: teleport to the small blue tower first and step over the edge; you’ll drop down to the ground. If you’re comfortable with that, try the big tower next. 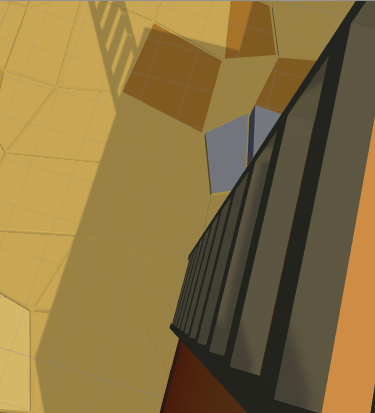 Another good reason to add body physics to your setup is that it allows you to add climbing, which you’ll look at next. One of most fun things to do in VR is to climb around Tomb Raider style toward your objective. With the help of VRTK, you can make almost any surface climbable. Need a fence to climb, a ladder or a wall of Jell-o? No problem, because in this section, you’ll prepare a ladder for climbing. Find the ladder under the AdvancedFullChapter9 GameObject and select it. You’ll notice it has a convex mesh collider attached to it, but you can use any kind of collider for the climbing to work. Open the VRTK setup wizard by selecting Window ▸ VRTK ▸ Setup Interactable Object in the top menu. While you could add the needed components manually, it’s usually much faster to use the setup wizard. 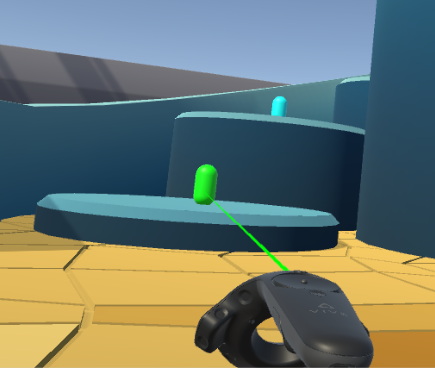 Check the Hold Button To Grab toggle, and set the Grab Attach Mechanic to Climbable. 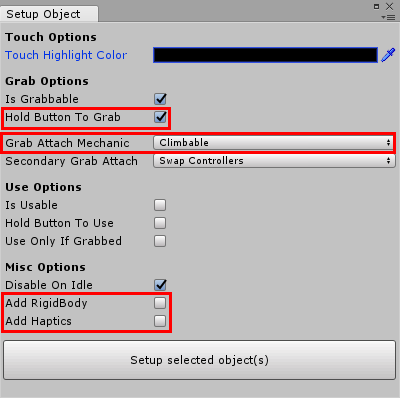 Uncheck Add RigidBody and Add Haptics. Click the Setup selected object(s) button to apply the changes. This adds a few new components to the ladder, including VRTK_Climbable Grab Attach. This is a special kind of grab component that communicates with the Play Area. 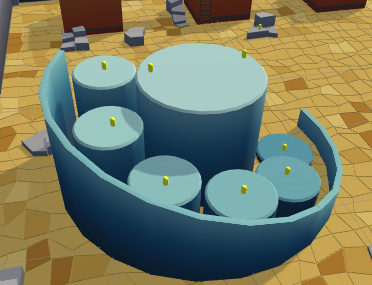 Only objects with this component attached are climbable. You generally don’t want players to climb up all the walls unless they’re Spiderman or something. 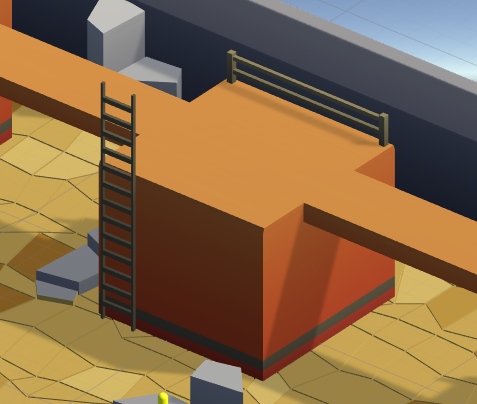 For climbing to fully function, you’ll also need to add a new component to the Play Area. Select Play Area and add a VRTK_PlayerClimb component to it. This is the crucial part that allows climbing to work; it manipulates the position of your virtual body when you grab a climbable object. For example, if you grab the ladder and move the controller that grabbed it downwards, you’ll pull yourself up and vice-versa. 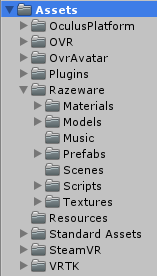 The custom settings are linked automatically if the components are present on the same GameObject, or any of its children, and the last two are optional. To deal with players putting their head into objects like walls and seeing straight through (instantly breaking all immersion in the progress), you can add a fade to black effect. To do this, you need two things: a way to know when the player’s head collides with a solid object, and a script that can fade the headset view to black and back again. Once again, VRTK has you covered. 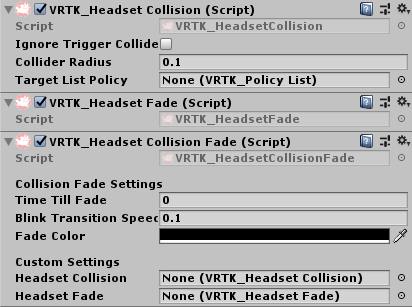 Add both a VRTK_HeadsetCollision and a VRTK_HeadsetCollisionFade component to the Play Area. After adding the latter, you’ll notice the VRTK_HeadsetFade component was automatically added. VRTK_HeadsetCollision reports to VRTK_HeadsetCollisionFade when the player’s head hits an object, which in turn calls VRTK_HeadsetFade to fade the player’s view to black. 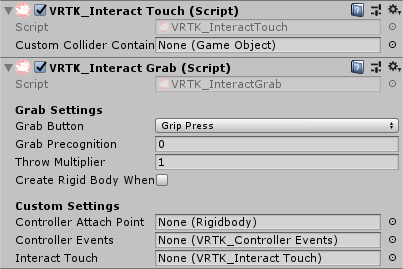 The final pieces of the puzzle are the VRTK_InteractGrab and VRTK_InteractTouch components. These are used by the climbing components to locate and use the controllers. That all that’s needed to implement climbing. Play the scene and teleport next to the ladder. Squeeze the controller while hovering over the ladder to grab it and pull yourself up. You can alternate between the controllers to climb all the way up like you would in real life. Any object can be made climbable. 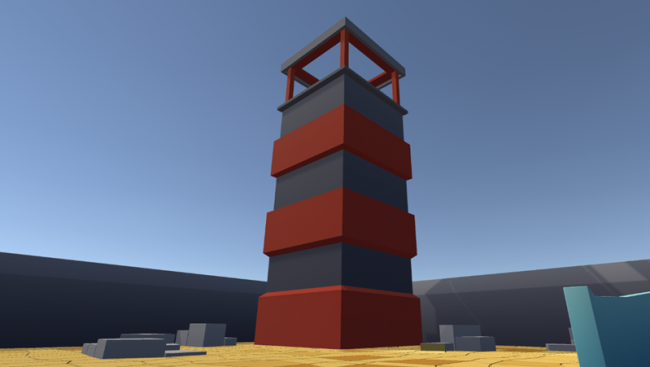 For example, climbing the huge tower instead of teleporting to the top would make for an exciting challenge. You’re welcome! You can download the final project for this tutorial using the “Download Materials” button at the top or bottom of this page. Congratulations, you made it to the end of this tutorial. If you had trouble following along, you can always review the final project for this tutorial. This was just the tip of the iceberg. There are many more ways of changing and enhancing the movement in VR. For example, vehicles like cars, boats and planes are an excellent way to avoid motion sickness and let the player move around quickly. Grappling hooks are also a neat option for movement. If you have questions or comments about this tutorial, please add them in the section below! What’s up with Laravel: Up and Running? selenium webdriver – Does One single script can automate entire matches? AiA 129 How do I Start My Single Page App?